At 1525 on April 6, 1945, Lieutenant Junior Grade Nobuo Ishibashi took off from Kanoya Air Base as pilot in a Zero fighter carrying a 250-kg bomb and died in a special (suicide) attack off Okinawa at the age of 25. 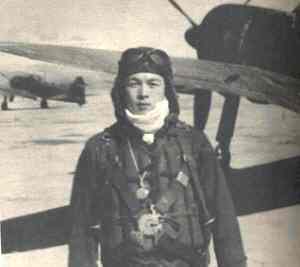 He was a member of the Kamikaze Special Attack Corps 1st Tsukuba Squadron. He was from Saga Prefecture, attended Tōa Dōbun Shoin Daigaku (East Asia Common Cultural College) in Shanghai, and was a member of the 13th Class of the Navy's Flight Reserve Students (Hikō Yobi Gakusei). Spring in Kyūshū is early. Both the cherry blossoms and rapeseed flowers are beautiful. Even though here is just like a battleground, somehow or other they create a peaceful feeling. Last night I slept soundly. I did not even dream. I am clear-headed, and I feel refreshed. Being on the same adjoining land , I feel that I want to visit there for a while. Give my regards to those at Eigenji Temple and others. The letter and poem on this page come from Kitagawa (1983, 145-6). The biographical information in the first paragraph comes Kitagawa (1983, 145) and Osuo (2005, 197-8). The photograph comes from Makino (1979, 185). 1. Kagoshima Prefecture, where Kanoya Air Base is located, and Saga Prefecture, where Nobuo Ishibashi grew up, are both on the southernmost main Japanese island of Kyūshū. Makino, Kikuo, ed. 1979. Ichioku nin no shōwa shi (Nihon no senshi 4): Tokubetsu kōgekitai (Shōwa history of 100 million people (Japan's war history, Volume 4): Special Attack Corps). Tokyo: Mainichi Shinbunsha.